Keeping in mind the diverse requirements of the clients, we offer an extensive array of Impregnated Fiberglass Net. Our entire product range ensures excellent ventilation and is easy to maintain. 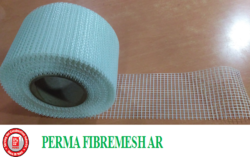 Impregnated Fiberglass Net requires minimum maintenance and is offered with customized solutions. We are offering Fiberglass Mosaic Mesh to our clients. Other Details: Lay on 1st coat on floor in wet conditions and 2nd coat after dry up.